New Bill Would Repeal Red Light/Speed Cameras! We filled the hearing room in Olympia yesterday to speak out against traffic cameras. We didn’t show up just to complain, but we also offered a solution! Repeal the law that makes the cameras legal in the first place! Over the last few days we have worked very hard speaking to legislators and asking them to introduce a bill that would repeal the law, and not just tinker with it. Rep. Morris agreed to introduce a bill to repeal the law. You can make an immediate difference. 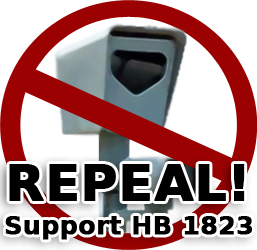 Call / email / fax your State House Representatives today and urge them to co-sponsor HB 1823 repealing Automated Ticketing Machines. The deadline for co-sponsorship is Tomorrow, Feb. 3rd at 2pm. Look up your representative’s contact information here. “There is a bill being circulated regarding the repeal of state laws that allow the use of traffic cameras – HB 1823. As a voter in your district, please know that I and many of my neighbors support this legislation. Many studies reveal that traffic cameras actually reduce safety. I certainly support ways to make our streets safer but there are engineered methods that are effective, Automated Ticketing Machines are not. The way bill introduction works in Washington State, co-sponsors can only be added for a limited time after the bill’s official introduction. The cutoff to co-sponsor will be Thursday, Feb. 3rd at 2pm. It’s important to act quickly! There have been bills introduced this year modifying the law allowing Automated Ticketing Machines. The bills tinker with requiring mandatory study periods, lengthening the “yellow change interval” at intersections, etc. These are prime examples of trying to make a bad law into a law that is “less bad”. The tinkering bills would make the law worse than it already is! If there is a bad law on the books, the right thing to do is to repeal the law. Support HB 1823 that simply repeals Automated Ticketing Machines.